South Bend Mayor Pete Buttigieg said that marrying his husband Chasten brought him closer to God. 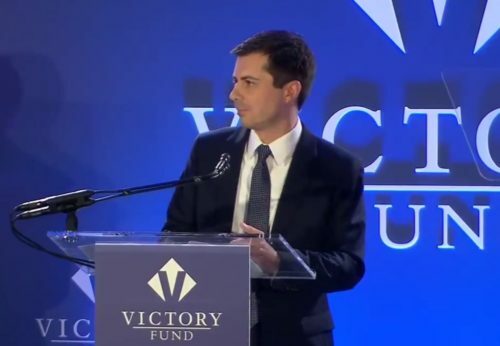 Speaking at the LGBTQ Victory Fund’s annual brunch yesterday, Buttigieg addressed Mike Pence’s longstanding opposition to marriage equality. Pence, like others who oppose equal rights for LGBTQ people, often frames his political opinions are religious ones. Buttigieg is Christian and said that his marriage is good on those terms. The mayor went on to say that homophobes have a problem with how the world works, not a “disagreement” with a “choice” that LGBTQ people. “That’s the thing I wish the Mike Pences of the world would understand, that if you have a problem with who I am, your quarrel is not with me. Your quarrel, sir, is with my creator,” he said. The mayor spoke about several topics important to LGBTQ voters, including the transgender military ban. He brought up the fact that Donald Trump avoided the draft multiple times during the Vietnam War. “The struggle is not over when transgender troops, ready to put their lives on the line for this country, have their careers threatened with ruin one tweet at a time by a Commander-in-Chief who himself pretended to be disabled in order to get out of serving,” Buttigieg, a Navy veteran, said. Supporters were living for his speech on Twitter. It really makes me feel so good to know you're out and proud. One of my daughters, one of my sons, and my nephew are open and proudly gay. I am so thrilled there is someone out there willing to speak up for them! Good luck with the campaign and don't forget Pennsylvania!